Following the epic birthday party / wake event, I finally got Poker and Canasta moved out. They moved in with Heriberto Coronado, Canasta’s beau, and from now on I don’t need to worry about them anymore. I do keep running into them here and there, but that’s normal and welcome. …and Holdem moped about for a week solid, alternating between crying over his empty nest and crying over the lady who died at the party (whose name I still can’t remember and likely never will). Slapjack found his young lady again (yay!) and asked her over to the house. 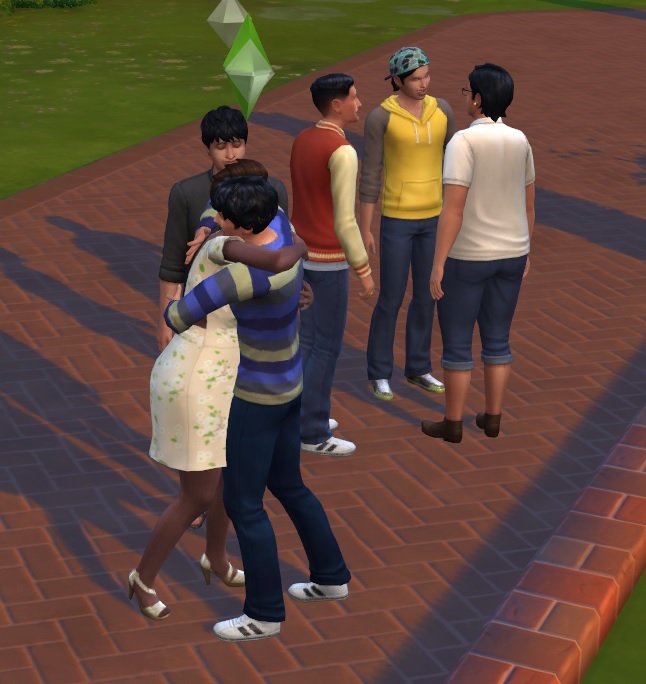 Things went swimmingly up until the first kiss, and then he discovered she’s noncommittal, mostly because she suddenly decided she just wasn’t that into him. 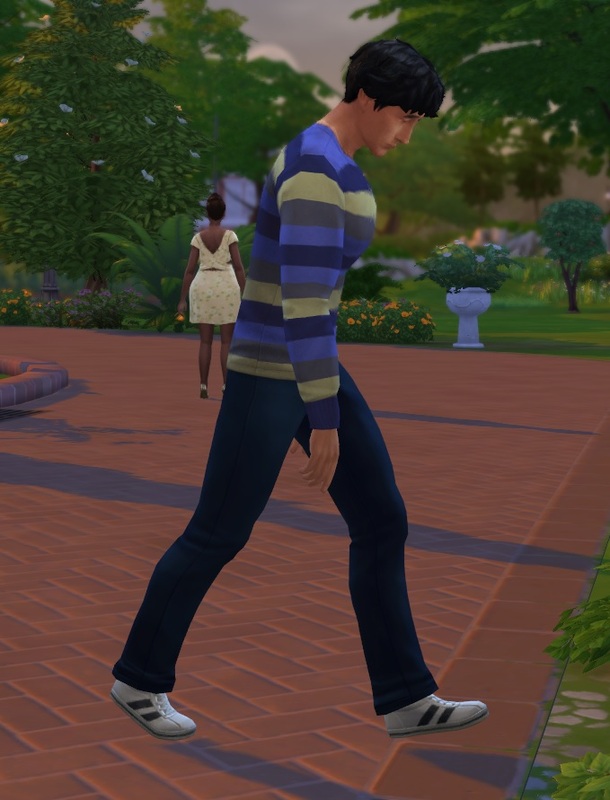 He hasn’t given up yet, but I can tell you from experience that noncommital Sims are a major pain in the backside when it comes to anything beyond flirting; might as well call it ‘hard to get’ and be done with it. 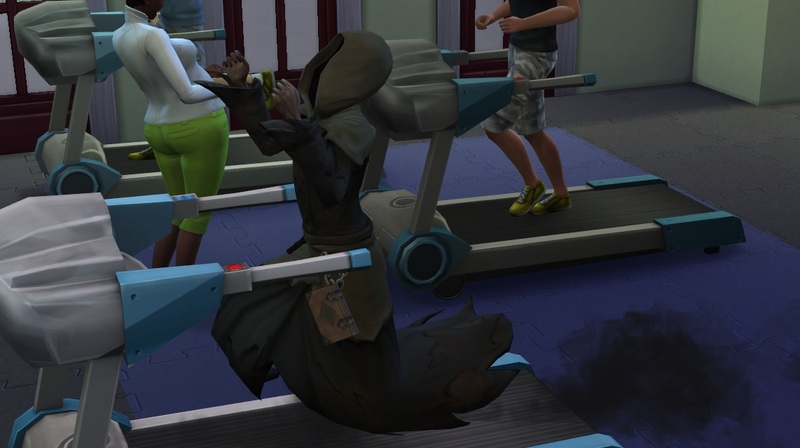 He took her to the gym on a date, which in hindsight might not have been the most romantic location but did allow me to witness a couple of fun things. First, this guy, with the same expression I’d be wearing if the Grim Reaper were following me down the street. 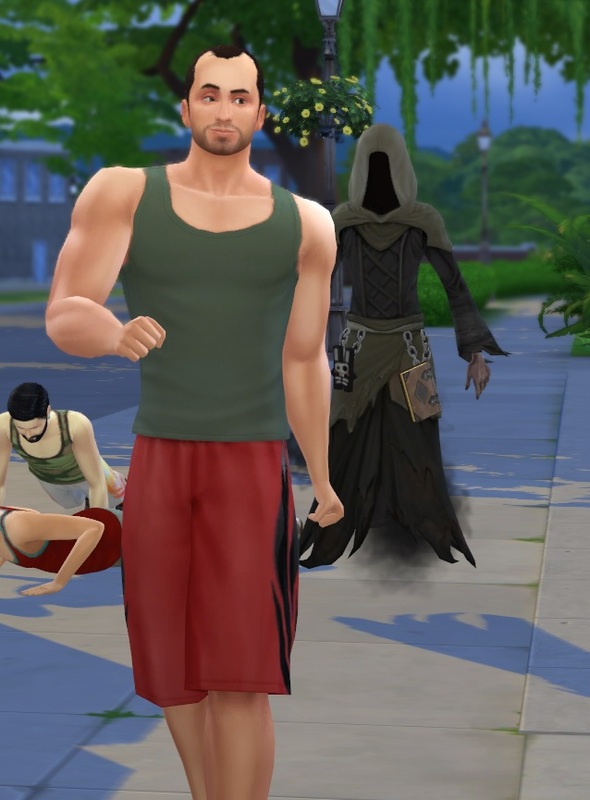 Second, it turned out that Mr. Reaper was simply heading to the gym himself. I guess that svelte figure doesn’t look after itself. Finally, I fell to my usual curse of altoholism and decided to start a legacy where I try to be as uncontrolling as possible, which is not an easy goal for me. 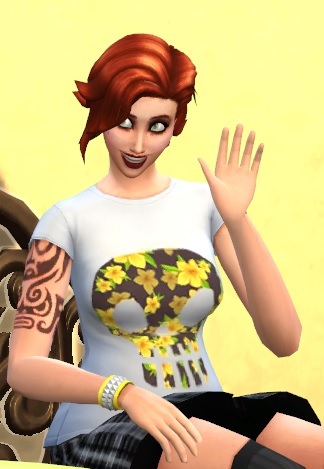 I therefore made Liberty von Frei, a feisty young lady who, as it turns out, bears a startling resemblance to the Joker. Or maybe it’s just me? 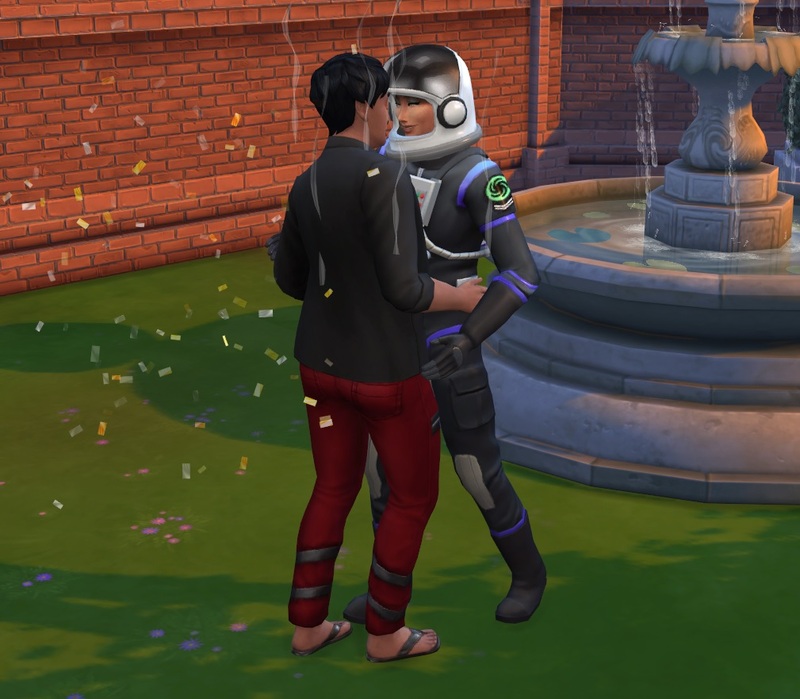 That guy should be looking a lot more scared, though as of the end of the first quick play-session, Liberty is either bi, gay, or just a total narcissist (having got it on with 2 people and currently preferring the young lady who is also called ‘Liberty’). 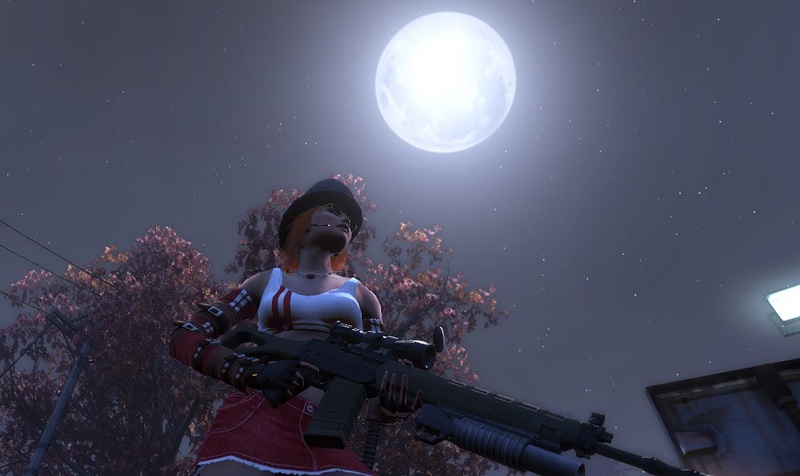 Not sure I’ll keep playing her, but it was entertaining.